The Bourgogne region, its culture and its pleasures aren’t just for grown-ups ! Younger visitors can also discover the secrets of the vine and winemaking. Games, stories and educational tools – we have everything you need to introduce a younger audience to the riches of the Bourgogne winegrowing region. “Once upon a time...” Even in the land of vines of Bourgogne, the best fairytales begin with these four words ! Discover and tell the story of the adventures of these two little grapes who become the world’s best friends before going on an exceptional adventure together. In either book version or audio (available for free download in French only), “The Adventures of Beaugrain and Joligrain in the Kingdom of Vines of Bourgogne” will delight young children whilst teaching them what actually happens in the vineyards of the Bourgogne region. “A moi l’aventure !” (My Adventure !) is a games set that will delight children aged 3-10. It includes two puzzles, 30 question cards about the Bourgogne winegrowing region (with true/false and I agree/I disagree answers) and a game of pairs. 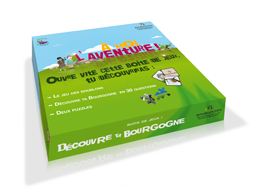 These games will introduce your children to the riches of the Bourgogne winegrowing region, whether it's the grape varietals used, the tools used in the vines, the aromas and flavors found in Bourgogne appellations or the local wildlife. This game, in both English and French, is available in certain cellars to entertain your children while you enjoy your tasting. You can also buy it from our online boutique. Are you heading to the Bourgogne region for a few days ? Do you want to visit some cellars ? Is it raining and do your children have nothing to do ? Here is a simple and free solution ! Download our games files (in French only) to entertain your children aged 6-10. 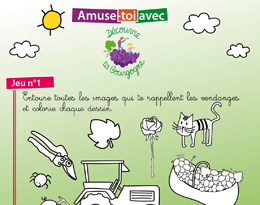 There’s something for everyone : coloring, crosswords, spot the differences, put the story in the right order – they will discover what happens in the vines and cellars of the Bourgogne winegrowing region, while having fun ! To them, it’s something fun to do. To you, it’s a few moments of peace !